Ideal for use in remote areas. Self-contained battery recommended for single-wire clean fence. Good output and convenient. Ultra Low Impedance. Controls up to 40 acres of clean fence. 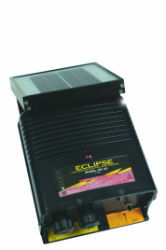 Outperforms rival 10 mile solar energizers. Recommended use for cattle/cows, horses, pigs, dogs and garden animals.